Westford Community Composting (WCC) wants to energize and empower the community of Westford with the knowledge and practice of composting as a way to reduce waste, be better stewards of the earth, and create healthy soils and plants. 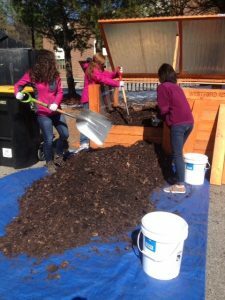 In 2015, the WCC helped pilot Westford Academy’s innovative on-site food scraps composting program; the first year WA diverted more than 5,500 lbs of food scraps from trash to create over 8 yards of premium compost, some of which was donated to their school gardens, and the remainder screened and bagged for sale with proceeds going toward sustaining the program. The WCC helps support the efforts of food scraps composting at Crisafulli, Blanchard and Westford Academy by organizing volunteers to haul food scraps twice a week to a local farm for composting, setting up logistics, and occasionally providing lunchtime guidance to students on what to compost and recycle. Want to buy the best sustainable compost for your garden? Of course you do! 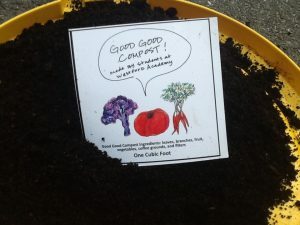 Buy Good Good compost at the Westford Farmers Market for only $10/bag! Made right here in Westford by our Westford Academy students, each 1 cu. ft bag of Good Good Compost was hand-screened and made with fruit & vegetable scraps from Westford Academy along with coffee grounds and leaves. Good Good Compost was fully lab tested! Each bag you buy will not only support your garden but ALL proceeds will also support WA’s Food Scraps Composting Program. Mission Statement: WCC aims to achieve this vision through education, volunteerism, community outreach, with programs that encourage active composting practice. 1) Encourage and guide the participation of Westford schools to collect their food scraps for composting to reduce their trash and capture this resource to benefit our soils. 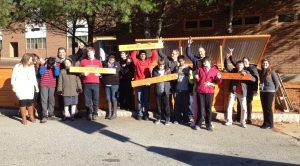 Support on-site composting of food scraps by schools with piloting programs. 2) Expand composting practices in Westford (at schools, community gardens, farms, residential backyards, and possibly at a dedicated town site). 3) Educate and promote composting by conducting workshops and providing information about composting.